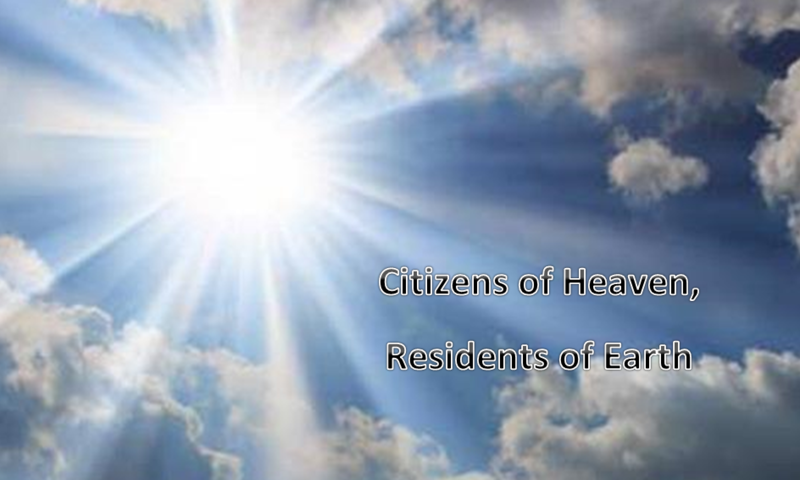 This morning, we begin a new sermon series, entitled Citizens of Heaven, Residents of Earth. It is a series that was not my original intention for this time. I standardly plan our worship themes out approximately 6 months at a time. And I had planned something else for May. During Holy Week, I heard God and God’s people clearly instruct that we need some teaching around a Christian worldview in the face of the political firestorm swirling around us in this country. After prayer and discernment, I adjusted my focus to respond to God’s call and continue to do so with some fear and reverence. Let me be clear to say that the role of the Church is never to say that following Jesus only looks like voting this way or that way. The role of the Church is to guide, convict, and encourage those who follow Christ to follow Christ in all aspects of their lives and to think through their beliefs and understandings to their full understandings in God’s grace. In that light, we take a look at the story of Lydia. We heard the short passage from the book of Acts, let’s get a bit more context from Adam Hamilton, who is on the ground where Lydia met Paul and gave her life to Christ. Did you catch the last thing Adam Hamilton said? Lydia and her family were the first converts on the new continent of Europe! Often, we hear the story of Lydia and her family as a sweet and non-threatening. Listen again, if I would have read that they were the first converts out of Africa or refugees from Syria, if they were migrants without proper documentation or their house held more people than they had windows. Paul felt a tug on his soul, through his dreams to visit the people of Macedonia and to baptize these unknown others, Lydia and her family. Paul offered true hospitality. Bishop Will Willimon says it this way, “Christianity’s default position is hospitality, even as we received hospitality on the cross of Christ.” In the person of Jesus, God confounded all of our human understandings of good and proper. Jesus blurred the lines of us and them. Jesus ate with those who no one would eat with. Jesus saved those who seemed beyond saving. Jesus redeemed those who no one else would have redeemed. We can be honest about the challenges of tenderness towards cultures that are different from the ones that we are most familiar with; however, we are called to be situated as those who seek first and foremost to welcome as we have been welcomed. Welcome and love is in direct opposition to the position that says we first must be on guard and defend ourselves and then, consider others. Welcome is more than mere toleration, welcome is inclusion and incorporation. Where does our limitation in welcoming as God welcomes come from? Fear! We find ourselves experiencing fear when we encounter those who are not like us. It is a psychological response in which our bodies seek to minimize risk and danger. We avoid that which causes potential harm to self. When we come upon a stranger, there is often a response within our bodies where our hearts beat faster, our brain work faster, and adrenaline is pumping. However, we are not slave to our fears. In fact, we are responsible for addressing them. Noting and labeling fear actually begins to reduce not only our mental reaction, but our physical responses. We do not need to be captive to these reactions and fears. “Courage is not the absence of fear, but having a reason for doing the right thing in spite of our fear” Bishop Will Willimon. God has laid out for us time and time again that our motivation is the incredible and miraculous life, death, and resurrection of Jesus. If we understand that Jesus reconciled himself to us, even while we were sinners, we find ourselves compelled to overcome our biology and ration to live a life that reflects God’s values above all else. There is the old story about the high schooler who was being cajoled to make some dangerous choices of illegal behaviors. When the high schooler broken away and was reflecting later with the pastor, it was said, “I am more afraid of disappointing my mother than being bad-mouthed by those so called friends.” For whom are we living out our lives? It is our personal struggle, and it is our national struggle. It has been the recent practice of multiple political figures to define and describe themselves by who they need to keep out. But this is not a new practice. Each and every time, those in power have said this group of people can enjoy privileges and rights, and this group of people is not welcome here – lines have been drawn between us and them. This has been our political debate time and time again. Who is allowed here? Who is welcomed here? And who is not allowed or welcomed and must find place and space as OTHER? Instead of giving into the rhetoric of fear, you and I are called to weight the issues as one who knows the ultimate King and Ruler. We discover that no one is God’s migrant or refugee. No one is God’s excluded or OTHER. In God, we find communion and connection beyond the fear to welcome and inclusion, radically so. This morning, we take a new step in drawing the circle wider with God’s welcome. As we come for communion this morning, our elements are slightly altered. We will all be receiving from a gluten free loaf. Most recently, we have offered communion by breaking the bread as a representation of Christ for all and then offering separate wafers for those who are gluten free. With prayer, discernment, and reflection, we will be offering the loaf to all and making it accessible so all can receive. This is a correction on our practical theology. We believe that the welcome and invitation is for all, and had lived out actions in contrast to it. This loaf was made from all ingredients without wheat. This welcome is more than just toleration. It will taste different from a loaf of bread with gluten – welcoming one, impacts all. Let us consider how this step is microcosm for our world. I invite you as you come to receive to consider where is God inviting you to show courage in welcoming as Christ welcomed you. Where is God encouraging you not just to tolerate the other and set them aside, but to fully include the other into your life? Where is God calling you to reconsider how you have understood the other and make different choices politically and personally going forward? Jesus Christ walked among us to call us to a different way of living, life-transforming way of living as if Heaven was already here on earth. Willimon, Will. Fear of the Other: No Fear in Love. Nashville: Abingdon Press, 2016. 7. Sunday: “During the night Paul had a vision: there stood a man of Macedonia pleading with him and saying, ‘Come over to Macedonia and help us.’” Acts 16:9. God speaks to us in many ways. Are you listening to how God is sharing the needs of your neighbors with you? Monday: “When he had seen the vision, we immediately tried to cross over to Macedonia, being convinced that God had called us to proclaim the good news to them.” Acts 16: 10. Listening to God is the first step. Acting on what you heard is the second. Spend some time in prayer as you discern how you might act. Tuesday: “We set sail from Troas and took a straight course to Samothrace, the following day to Neapolis, and from there to Philippi, which is a leading city of the district of Macedonia and a Roman colony. We remained in this city for some days.” Acts 16: 11-12. Being among people opens our eyes to needs and opportunities. Take time to just be among people and let your eyes be opened. Wednesday: “On the Sabbath day we went outside the gate by the river, where we supposed there was a place of prayer; and we sat down and spoke to the women who had gathered there.” Acts 16:13. Sometimes our witness is with who shows up. Who is showing up in your life in need of hearing God’s good news? Thursday: “A certain woman named Lydia, a worshipper of God, was listening to us; she was from the city of Thyatira and a dealer in purple cloth. The Lord opened her heart to listen eagerly to what was said by Paul.” Acts 16:14. Prayerfully ask God to open your heart to hear God’s word eagerly. Friday: “When she and her household were baptized, she urged us, saying, ‘If you have judged me to be faithful to the Lord, come and stay at my home.’ And she prevailed upon us.” Acts 16: 15. Lydia’s faith was not just for herself, but for her whole family . Her actions followed from her faith. How is your faith informing your welcome and invitation to others? Saturday: “You shall also love the stranger, for you were strangers in the land of Egypt.” Deuteronomy 10:19. Which strangers is God calling you to love today?